When we review TV we normally do it by the season. Or at the very least by the Box-set. So it's a measure of our excitement for the new 2015 version of Danger Mouse that we decided to break with tradition. 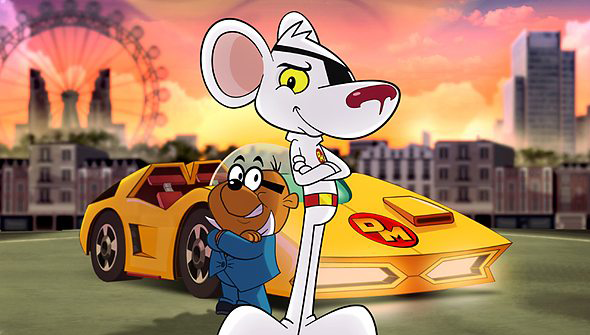 The original Danger Mouse, produced by the much missed Cosgrove Hall is iconic, a veritable classic of British animation. This reboot has an awful lot to live up to. So we're very pleased to be able to say that- based on this first batch of episodes- this is one revival that works very well indeed. For anyone who has never seen the original, Danger Mouse revolves around the adventures of "the greatest secret agent in the world".. who just happens to be a rodent. With his loyal hamster sidekick Penfold, DM foils the plans of various James Bond style villains. The remake sticks pretty closely to this formula, with a different threat to face each episode. The antagonists are fun and varied too, ranging from alien plants, robotic rampaging toilets and (best of all) a little girl super-villain who tries to turn the entire world pink and sparkly. The first episode (running around twice the usual 11 minutes) serves as a great introduction to the series for newcomers and reintroduction for fans of the original. Pitting DM once again his old nemesis Baron Greenback, the secret agent finds himself fired after accidentally destroying half of London. The pilot episode sees the show lay its stall out and reassures the audience it's in safe hands. While brought up to date with impressive visuals, the new series retains the whip-smart scripts that -just like the original- will entertain adults as much as children. Endearingly daft gags and slapstick will definitely work for the younger members of the audience, while other jokes and references will fly over their heads. Ireland's Boulder Media have done a fantastic job with the animation itself. While unmistakably still Danger Mouse, this very definitely looks like a twenty-first-century production. The animation is smooth and stylish and any digital flourishes are subtle and well integrated. The use of photographic backgrounds works well too, feeling like a natural update on the photocopy style backdrops used in the original. Where the 2015 version definitely has the edge though is in the action stakes. Fast, furious and fun the new DM is as adept in an action sequence as with a witty one-liner. Ultimately though it's the scripts that make this sing. This is clearly a remake made by people with great love for the material and it shines through with writing that feels like it perfectly captures the spirit of the originals. Heck, they've barely even messed with the theme-tune. The voice casting is inspired too. Alexander Armstrong is perfect in the title role, his voice proving a natural fit. Kevin Eldon as Penfold delivers a performance that fits the character while not being a straight-up imitation of the original. Elsewhere vocal performances are strong across the board, with special mention to Stephen Fry channeling Blackadder's General Melchett as DM's boss Colonel K.
Reviving a franchise as warmly remembered as Danger Mouse is always going to be a risky prospect. Yet against the odds, they've managed to pull it off, with style. For lovers of the original and newbies alike, the new Danger Mouse is not to be missed. Welcome back, Chief! 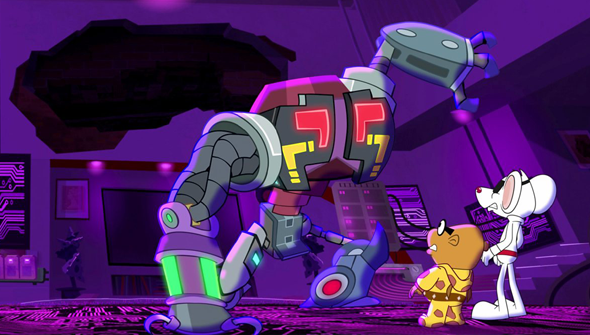 DANGER MOUSE is currently airing weekdays at 6PM on the CBBC Channel (UK) and Each episode will be available for 30 days after airing on iPlayer. Coming to NETFLIX in the US in 2016.